Farmington, CT The UConn Health Academic Building addition has been certified LEED Gold, placing it among the top one-third most sustainable buildings in the state. Designed by Centerbrook Architects & Planners, the 12,800 s/f building exceeded expectations with its sustainable features. Originally targeted for LEED Silver, the academic building addition scored 65 points on the LEED scale to earn Building Design + Construction (BD+C) Gold. This is Centerbrook’s second-consecutive LEED-certified project that achieved Gold after an initial projection for Silver. The same occurred for the Academic Science & Laboratory Building at Southern Connecticut State University with its 2017 certification. 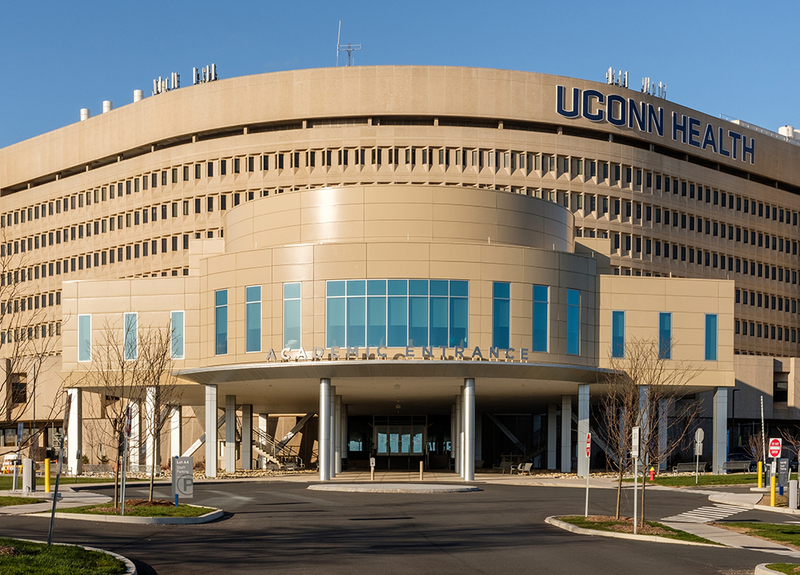 Built by Skanska USA, the academic building addition fronts UConn’s Schools of Medicine & Dental Medicine Building. The building is highlighted by a large, circular space shaped for small-unit, interactive, team-based learning known as the Academic Rotunda. Classrooms and study areas ring the rotunda, which is elevated above the newly established main entrance. The academic building addition scored high on the USGBC scorecard in the Sustainable Sites (20 of 26 points), Water Efficiency (7/10) and Innovation (5/6) categories. Perfect scores were achieved in a number of subcategories, including: Development Density and Community Connectivity, Alternative Transportation-Public Transportation Access and Water Efficient Landscaping. The project also earned four out of five points for the Innovation in Design subcategory. The academic building addition is the 20th LEED-certified project designed by Centerbrook. An additional five are currently slated for certification. The LEED certification system was established by the U.S. Green Building Council (USGBC) in 2000. Short for Leadership in Energy and Environmental Design, LEED is the foremost program for the design, construction and operation of green buildings. LEED-certified buildings are found in all 50 states and in 167 countries and territories worldwide. The academic building addition is one of three recent projects Centerbrook has designed on the UConn Health campus. The Jackson Laboratory for Genomic Medicine was completed in 2014 and certified LEED Gold while the UConn Health Outpatient Pavilion opened in 2015 and is projected to attain LEED Silver. All are premier projects in the Bioscience Connecticut initiative.